This rifle according to what I have read was made by one of the more renowned target rifle builders. 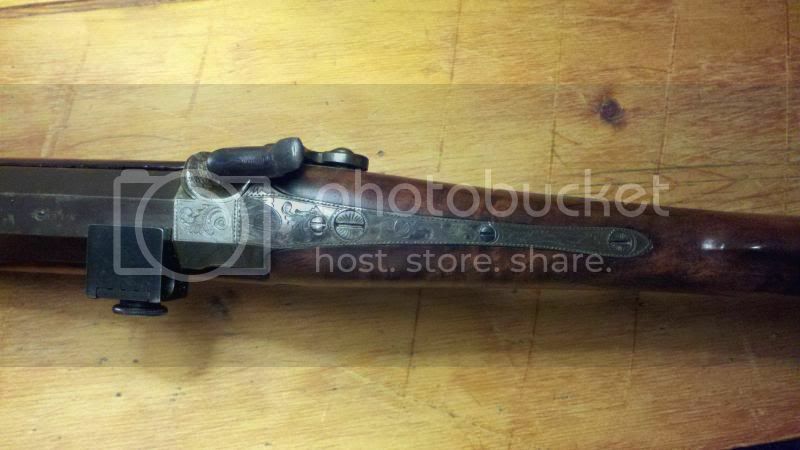 The heavy one and a half inch diameter barrel is marked, "N. Lewis Troy NY." I'm not sure of the weight but it is probably 20 lbs. or more. While the rifle was being shipped, it must have shifted in the carton and the weight of the heavy barrel pulled the trunnion from under the barrel and I am in the process of reinstalling it in the wedge. The bore is as clean as the day it was made. 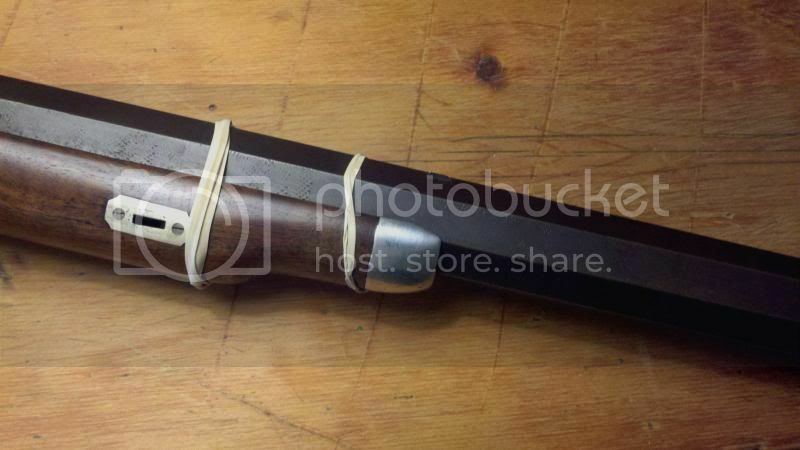 The barrel length is 30 inches with the false muzzle. 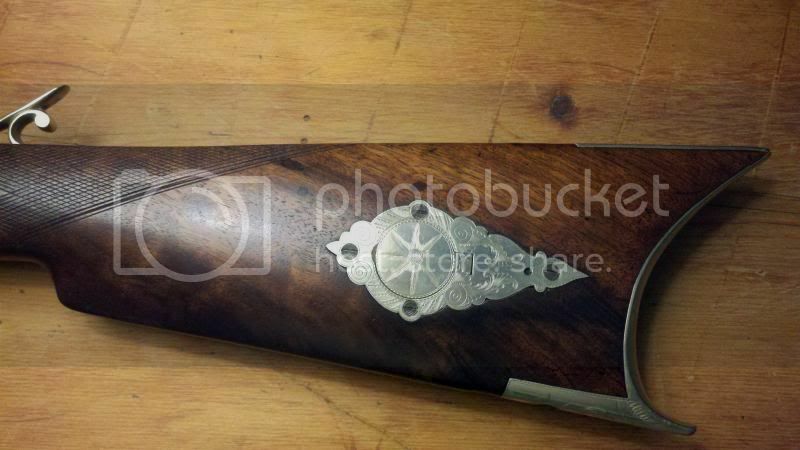 All of the silver mountings as well as the lockplate and breech are finely engraved. One question I have is the receiver sight is obviously not original to the rifle. 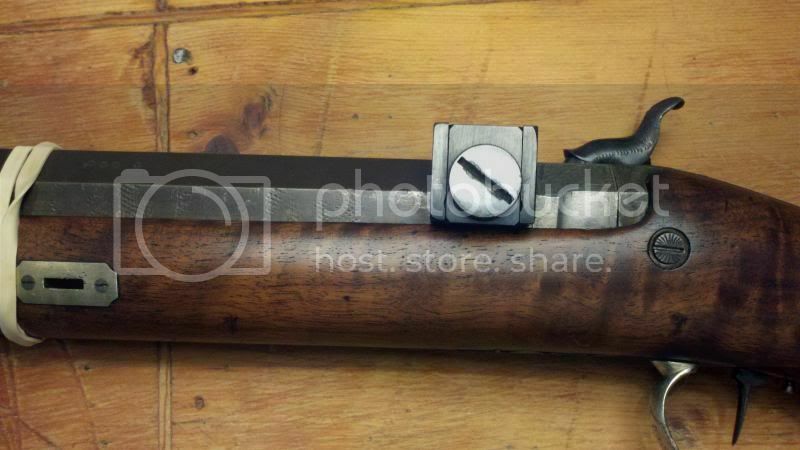 Does anyone know what make or who made this receiver sight which has the peep sight arm missing? 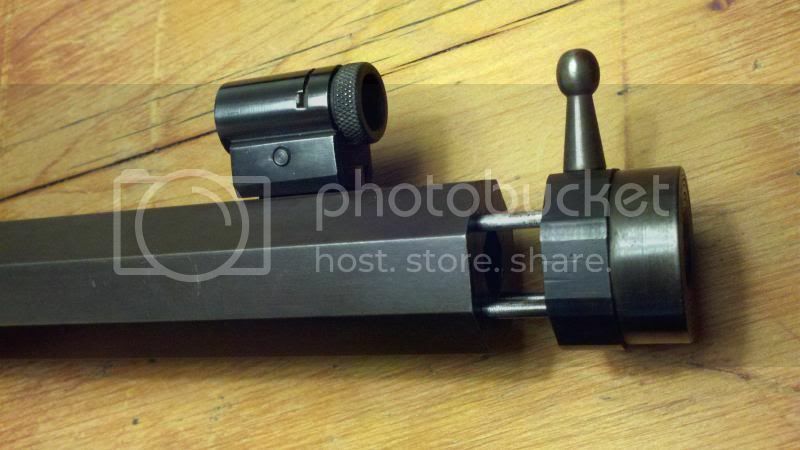 The tang is also drilled and tapped for a vernier tang sight and not the usual seen lollipop sight. 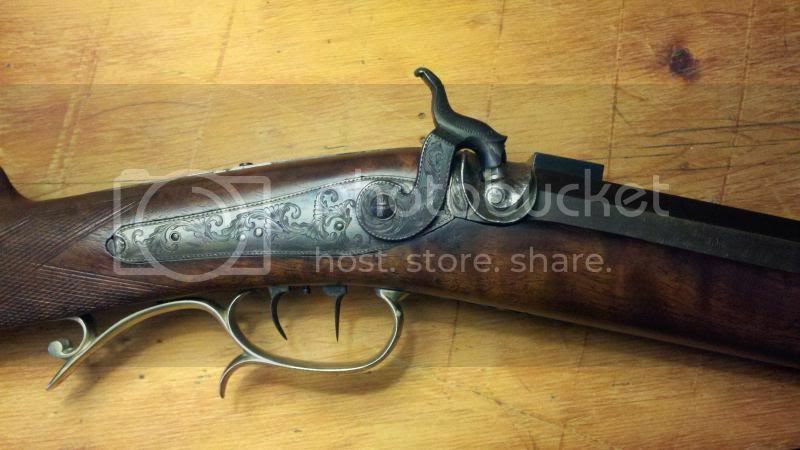 I am interested in shooting this rifle and would probably leave the receiver sight on it if I could find the missing part. Although I have trouble handling them any more, I love the big old target rifles. All I can say is WOW, you've got a honey with this one. That extra screw hole on the tang... looks like it might have been for a lollypop sight. Just did a google search for N Lewis rifles and most had a folding lollypop. In the 1944 book by Ned H. Roberts "The Muzzle-Loading Cap Lock Rifle" Mr. Nelson Lewis of Troy New York is mentioned several times and a picture of one of his rifles that is very much like yours is included. 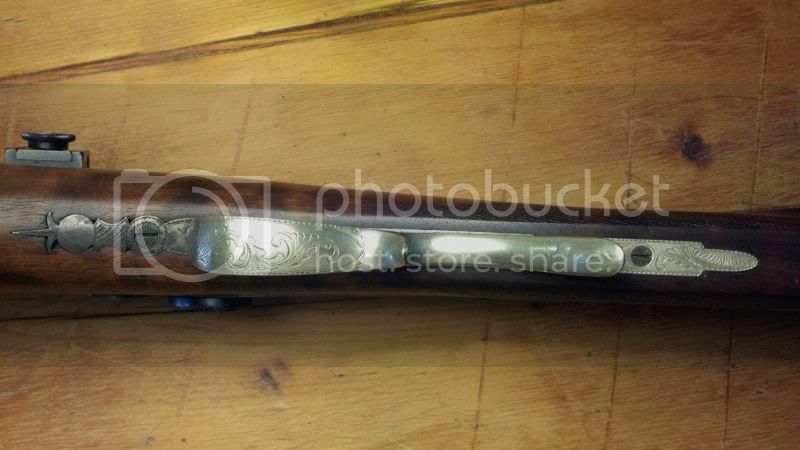 Your rifle bore is very likely to have gain twist rifling as that is virtually the only type Lewis made. He was a great believer in that style of bore for target shooting. In fact the author says "Lewis absolutely believed that the gain twist rifling was the very best for the finest accuracy and positively refused to make any rifle with the uniform twist." Lewis was a member of the Troy [NY] Rifle Club -- which was organized before the Civil War. 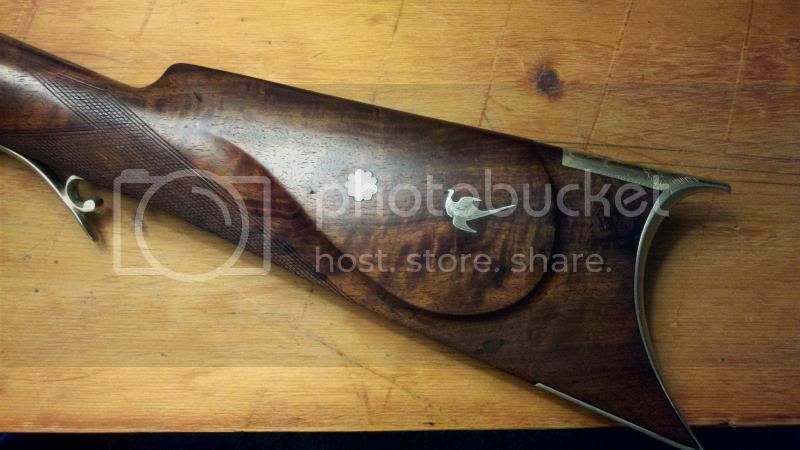 Lewis made the lock and triggers for his rifles and I am betting he made the sights also (I can't prove that). The N. Lewis rifle pictured in the book shows not a lolly-pop tang sight but an extended peep with a post support coming up from the tang. Something to chew on. Per the book all of Lewis's contemporaries believed that Lewis was a fine workman and created guns that gave "the very finest accuracy at all ranges." 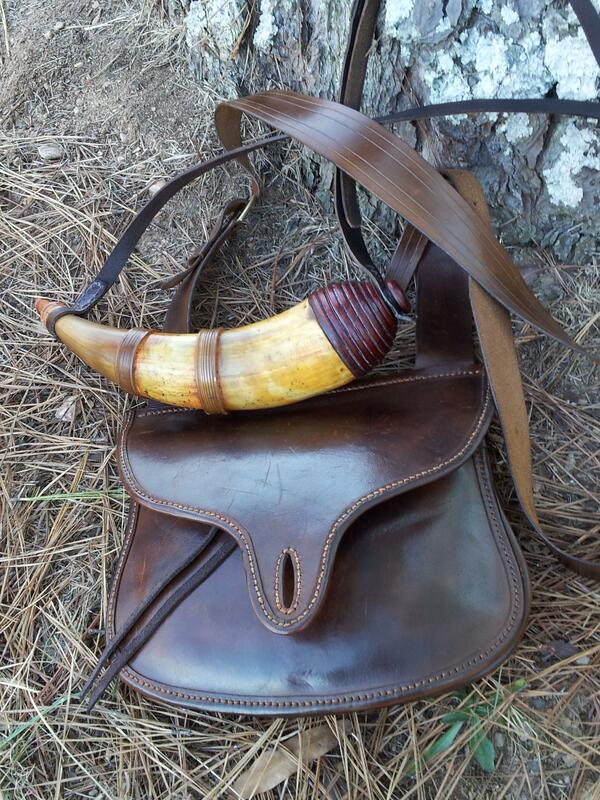 What you have there is a beautiful rifle made by one of the best practicing gunsmiths of his time and incorporating the latest muzzleloading technology circa 1880's. If the tang is already drilled and tapped for a vernier tang sight, why not put one on. There are any number of repops available with varying screw hole centers or you may find an original that will fit. 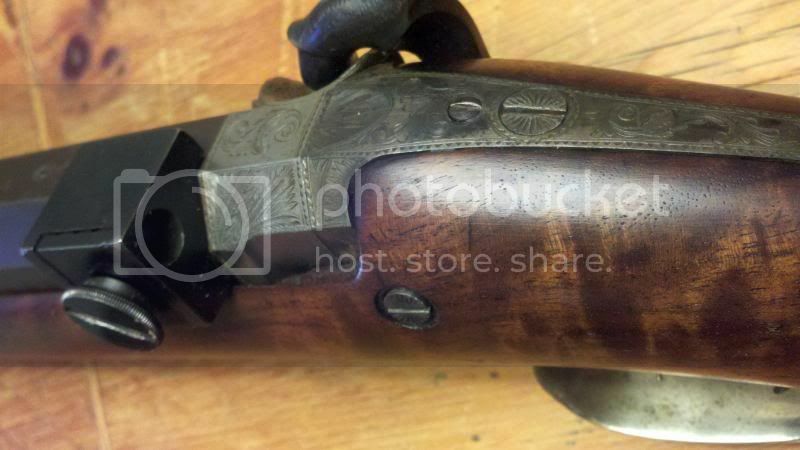 The rifle looks to be in fine condition and the addition of an original sight might be what puts it over the top. 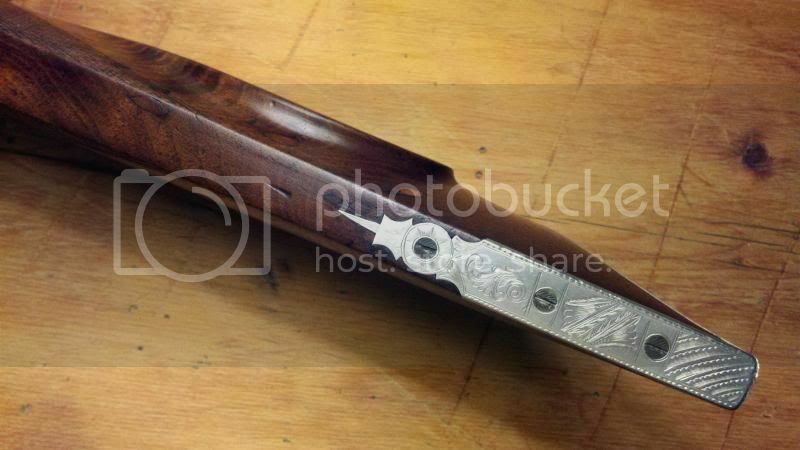 Perhaps Montana Vintage Arms Co, who makes various tang sights for black powder cartridge rifles would accept a special order to either drill a base with your specs or to send you an undrilled base which you could then drill and mount. Perhaps you could cut a shim plate, 1/8" thick, that matches the current tang and screw layout then drill the shim plate to fit a sight that you find available. This rifle appears to be the N. Lewis rifle I once owned. It has gain twist rifling. I slugged it at approximately .508" bore diameter. It shoots well, with extremely quick percussion ignition based on my one trip to the range with it. When I owned it, it had a ramrod, a bullet starter and the modern adjustable peep sight that mounted on the side mount sight base at the breech. Hornturner, It may very well be your old rifle. Yes, it does have a long quality ramrod, loading rod, unattached to the rifle. Would you have an idea as to the value as it is not so much my collecting interest.